AUSTIN, TX--(Marketwire - Mar 6, 2013) - Convinced there's a better way to get things done than by email, Tracky and Watchitoo today announced they are joining forces to shape the future of collaboration. Tracky, a Web-based social collaboration platform, is integrating the Watchitoo Playground videoconferencing platform into its interface. The partners will unveil the product Sunday, March 10, at SXSW 2013 in Austin, Texas. Playground will be available to every Tracky user thereafter. Visit the #VegasTech booth for a demo through Tuesday, March 12. Tracky is an open social collaboration platform for accomplishing things as a project team, circle of friends or group of kindred spirits on the Internet. Watchitoo's Playground is a Web-based videoconferencing platform enabling people to speak face to face and share multimedia content. Phase one of the partnership will enable users to launch Watchitoo Playground sessions in Tracky so they can meet face to face in real time to advance their Tracky projects. "These are two hot collaboration platforms, and together they present a new way of working that's intuitive, fluid, social, immediate and personal," said Jennifer Gosse, Tracky chief marketing officer. "This integration is all about productivity. Consider it another blow against the cult of email." 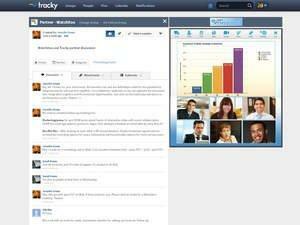 Unlike collaboration platforms such as Yammer, Tracky is not restricted to a closed group of co-workers. From the Tracky interface, users can invite their social network contacts (e.g. Twitter, Facebook) to their projects as well as discover new contacts and invite them into an open project such as a grassroots social movement. Work-related initiatives and invite-only parties, however, can still be private. "Watchitoo's Playground and Tracky are a perfect fit," said Watchitoo CEO Rony Zarom. "They're both entirely Web-based, require no software downloads and let people come together naturally to work or play. They're beloved by productivity junkies and early technology adopters, and are disrupting entrenched applications." The Tracky/Playground combination is free and supports up to 11 videoconference participants at a time. A paid upgrade enables up to 25 Watchitoo users to participate (more than any other videoconferencing platform) as well as screen sharing, recording and archiving. A further upgrade includes Watchitoo's control room and Twitter/Facebook integration, and the ability to stream to thousands of users. In partnership, Watchitoo and Tracky will be providing live coverage from SXSW March 12th from 1-3pm. Social media expert Sarah Evans (@PRSarahevans) will host 2 hours of interactive interviews with key digital executives, thought leaders and tech innovators from leading brands trailblazing new trends and transforming the market. The live coverage will be available to viewers on various syndicated partner websites and Facebook pages including Cox Communications, VegasTechSXSW, inNEVation, Watchitoo, Tracky, Ticketcake and others. Tracky's social collaboration platform lets you organize all of your to-do's, work projects and social connections in one place -- from planning a wedding to launching an international brand. With Tracky, you can work socially and get more done in a single work hub, including: to-do lists, live chats, calendars, social publishing, task management, people and project discovery, social accountability, cloud-based storage and more. Connect. Collaborate. Share. Join us in the collaboration movement at www.tracky.com. New York-based Watchitoo provides an embeddable video collaboration platform to deliver live content in a highly engaging way. The Watchitoo platform allows multiple participants to see and hear one another in real-time, collaborate around any form of rich media, and be viewed by an audience scalable into the thousands. With Watchitoo, any viewer can become a participant and any participant can be switched back to a general viewer. For more information, visit www.watchitoo.com.